Calcium builds strong bones, and more is better–correct? Well, maybe not. Calcium supplementation has been considered the gold standard therapy for osteoporosis in the general population. It is given in both the placebo and treatment groups of trials evaluating antifracture efficacy of new therapies. Similarly, calcium-based phosphate binders have been considered the gold standard comparator for all new phosphate binders. However, large randomized trials demonstrate conflicting data on the antifracture efficacy of calcium supplementation, particularly in high doses, in patients with osteoporosis without CKD. In addition, recent data suggest an increased risk for cardiovascular events. These new studies raise safety concerns for the general approach with calcium supplementation and binders. 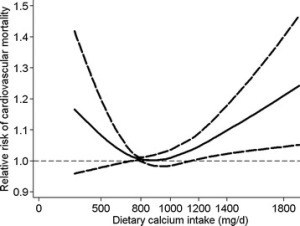 This review describes recent data on the adverse effects of calcium supplementation for osteoporosis and how these new data should affect the strategy for phosphate binder use in CKD. It is important to note that some clinical practice guidelines have been modified on the basis of this new literature suggesting potential risk. For example, in its recently published evidence-based guidelines, Osteoporosis Canada recommended a total intake of calcium (from diet and supplement) of 1200 mg per day, a decrease from the previous recommendation of 1500 mg in supplements (32). The American Society for Bone and Mineral Research issued a statement regarding the potential risks of calcium supplements and suggested, among other points, that “the beneficial effects of calcium are found with relatively low doses. More is not necessarily better. Individuals should discuss the amount of their calcium intake with their healthcare provider” (33). The Institute of Medicine now recommends a daily dietary reference allowance of calcium of 1000–1200 mg per day in the form of diet and supplements (34,35). Finally, the draft United States Preventive Services Task Force statement, pending public comment (http://www.uspreventiveservicestaskforce.org/draftrec3.htm), currently states “the current evidence is insufficient to assess the balance of the benefits and harms of combined vitamin D and calcium supplementation for the primary prevention of fractures in premenopausal women or in men.” Thus, these authorities acknowledge that although some calcium supplements may be beneficial for bone health, too much calcium may be harmful. Vitamin K supplementation for the primary prevention of osteoporotic fractures: is it cost-effective and is future research warranted? Lifetime supplementation with vitamin K, vitamin D(3), and calcium is likely to reduce fractures and increase survival in postmenopausal women. It would be a cost-effective intervention at commonly used thresholds, but high uncertainty around the cost-effectiveness estimates persists. Further research on the effect of vitamin K on fractures is warranted. Vitamin K might have a role in the primary prevention of fractures, but uncertainties about its effectiveness and cost-effectiveness persist. We developed a state-transition probabilistic microsimulation model to quantify the cost-effectiveness of various interventions to prevent fractures in 50-year-old postmenopausal women without osteoporosis. We compared no supplementation, vitamin D(3) (800 IU/day) with calcium (1,200 mg/day), and vitamin K(2) (45 mg/day) with vitamin D(3) and calcium (at the same doses). An additional analysis explored replacing vitamin K(2) with vitamin K(1) (5 mg/day). Adding vitamin K(2) to vitamin D(3) with calcium reduced the lifetime probability of at least one fracture by 25%, increased discounted survival by 0.7 quality-adjusted life-years (QALYs) (95% credible interval (CrI) 0.2; 1.3) and discounted costs by $8,956, yielding an incremental cost-effectiveness ratio (ICER) of $12,268/QALY. At a $50,000/QALY threshold, the probability of cost-effectiveness was 95% and the population expected value of perfect information (EVPI) was $28.9 billion. Adding vitamin K(1) to vitamin D and calcium reduced the lifetime probability of at least one fracture by 20%, increased discounted survival by 0.4 QALYs (95% CrI -1.9; 1.4) and discounted costs by $4,014, yielding an ICER of $9,557/QALY. At a $50,000/QALY threshold, the probability of cost-effectiveness was 80% while the EVPI was $414.9 billion. The efficacy of vitamin K was the most important parameter in sensitivity analyses. Lifetime supplementation with vitamin K, vitamin D(3), and calcium is likely to reduce fractures and increase survival in postmenopausal women. Given high uncertainty around the cost-effectiveness estimates, further research on the efficacy of vitamin K on fractures is warranted. 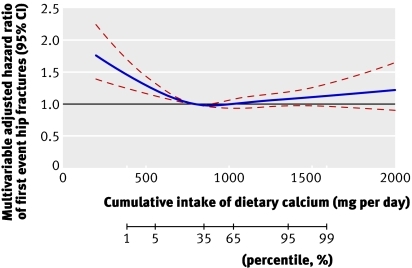 Evidence for an interaction between calcium intake and physical activity on changes in bone mineral density. Results of trials on the effects of physical activity on bone mineral density (BMD) are conflicting. 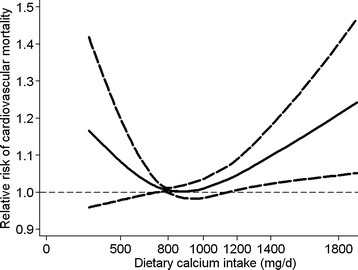 The current hypothesis was that calcium intake modifies the bone response to physical activity. Published trials on physical activity and bone density were reviewed, and the results of 17 trials are summarized. Physical activity has beneficial effects on BMD at high calcium intakes, with no effect at mean calcium intakes less than a mean of 1000 mg/day. The modifying effect of calcium intake on BMD among exercise groups is more pronounced in the lumbar spine than in the radius. This analysis may explain conflicting results of trials on physical activity and calcium effects on bone. Controlled trials designed to test adequately this hypothesis are needed.